MalwareGone™ - How Does It Work? This isn't your average malware cleanup tool. Instead of relying on just signatures, MalwareGone™ utilizes actionable intelligence from ChangeAlerts™ and examines the collected information. This approach allows the scanner to discover which files act and look like malware. It's designed to discover viruses, trojans, rootkits, spyware and other malware on any websites. It searches for early-life and next-generation malware; the kind of malware that doesn't yet have a detection signature. MalwareGone™ removes persistent threats from within the operating system by utilizing prior backups stored in CodeGuard's cloud. This ensures that remediation happens as quickly, efficiently, and accurately as possible - no more destroyed websites from a "fixing" service. 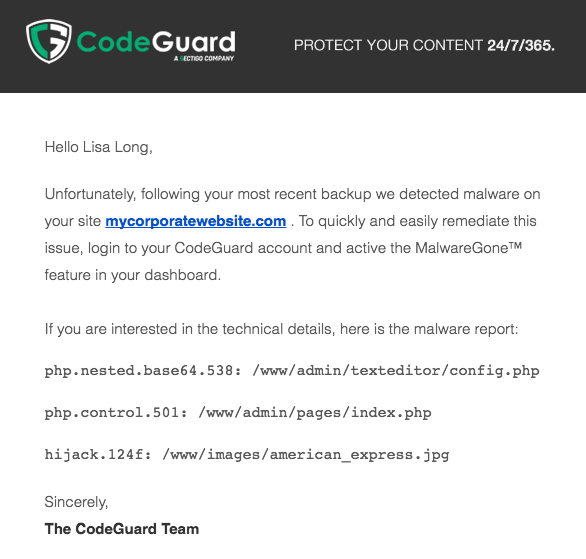 In addition to industry leading backup and recovery solutions, CodeGuard's patented MalwareGone™ functionality will automatically scan, discover and fix any threats your website encounters. Without MalwareGone™, these infections may go unnoticed indefinitely. Hackers don't need to deface your site to spread malware to your visitors and get you blacklisted by Google. CodeGuard protects you against this with MalwareGone™. While monitoring your site, if we detect any malware, viruses or spyware you will receive notification from us instantly and you can begin the remediation process with one click. CodeGuard monitors your website daily to safeguard your content and reputation using state-of-the-art tools. In addition to sending ChangeAlert™ email notifications in the event that any web content changes are detected, CodeGuard will also instantly alert you in the event that viruses, trojans, rootkits, spyware or other malware appear on your site. You can then quickly take corrective action, starting with restoring your site using the CodeGuard MalwareGone™ feature. Screenshot of the MalwareGone™ Alert notification.